What a FUN PARTY I have to share today! This CONSTRUCTION PARTY is truly one of my FAVORITE PARTY SETS. It has absolutely everything you could ever dream of to make your own child's construction birthday party a real hit! 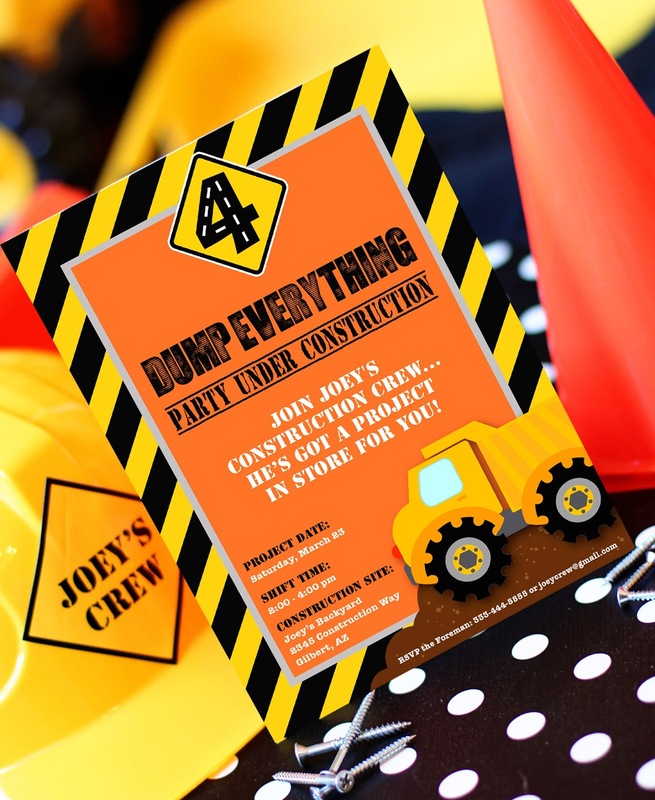 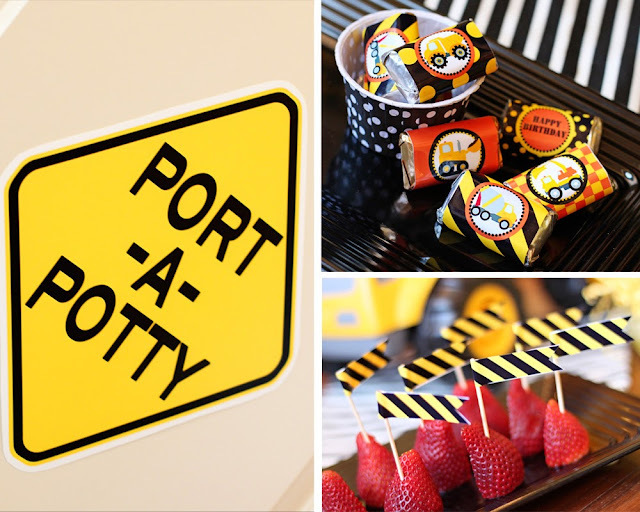 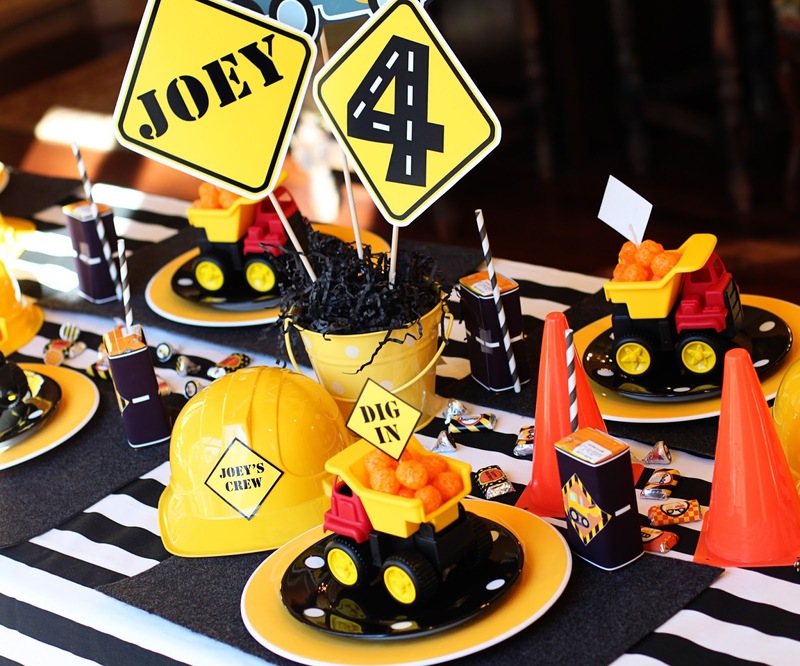 We are lucky enough to have some great party photos as well from Cris McGrath of Crissy's Crafts who is sharing her son's CONSTRUCTION PARTY and some really great ideas you are sure to DIG! 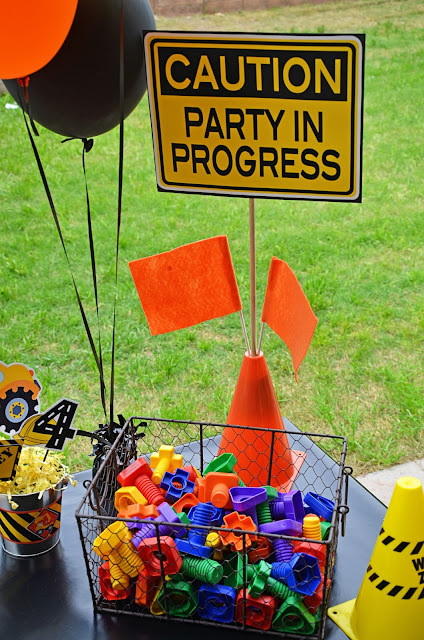 (Read below photos for all party details). 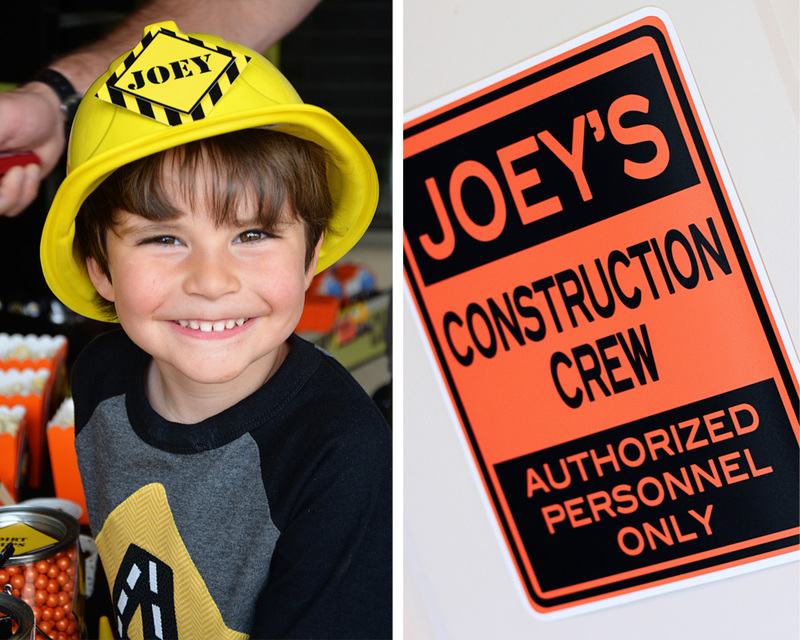 My son is fanatic about trucks and everything that has to do with construction. 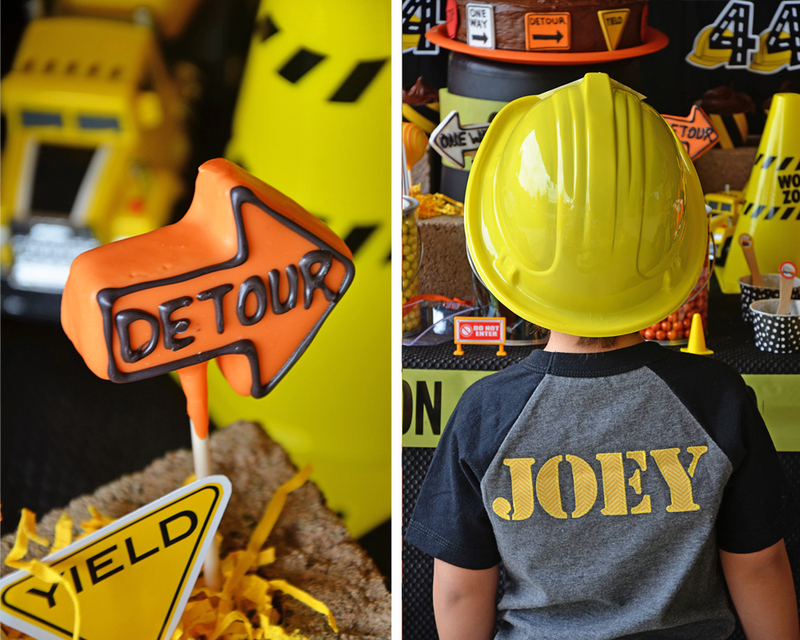 Every time we go somewhere, he is always on the look out for construction sites. 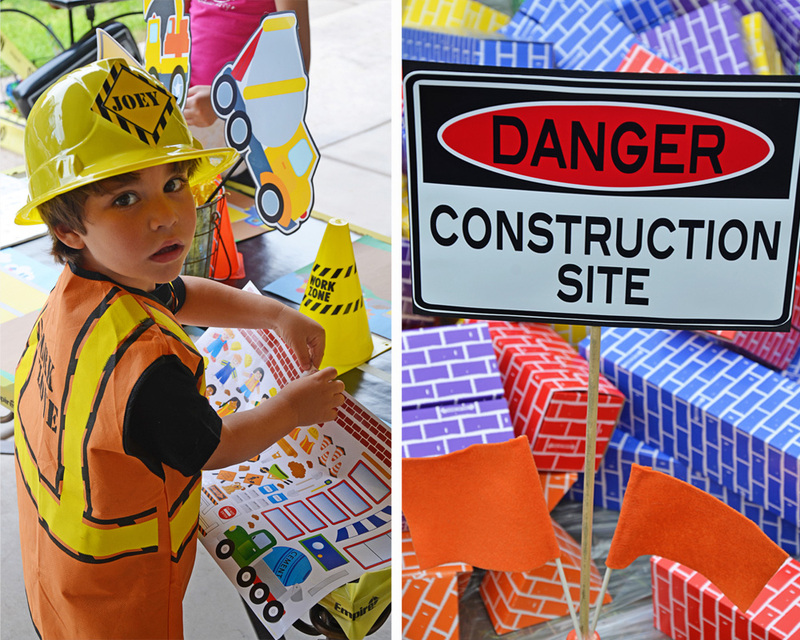 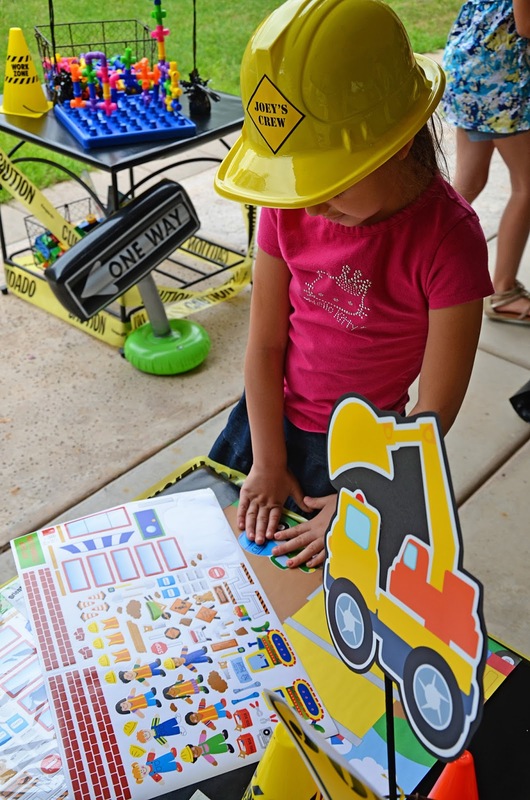 We had a lot of fun “building” this construction themed party! 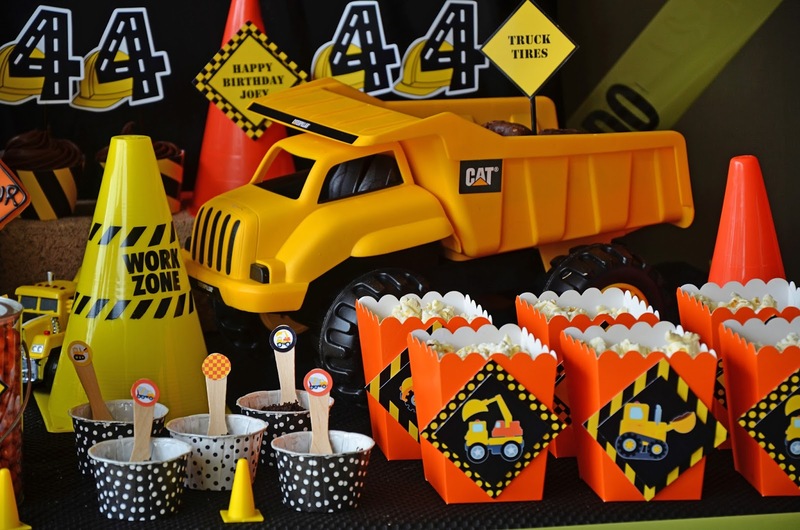 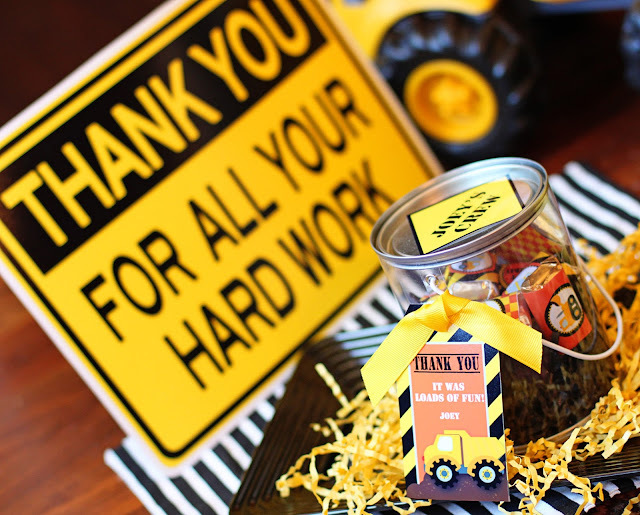 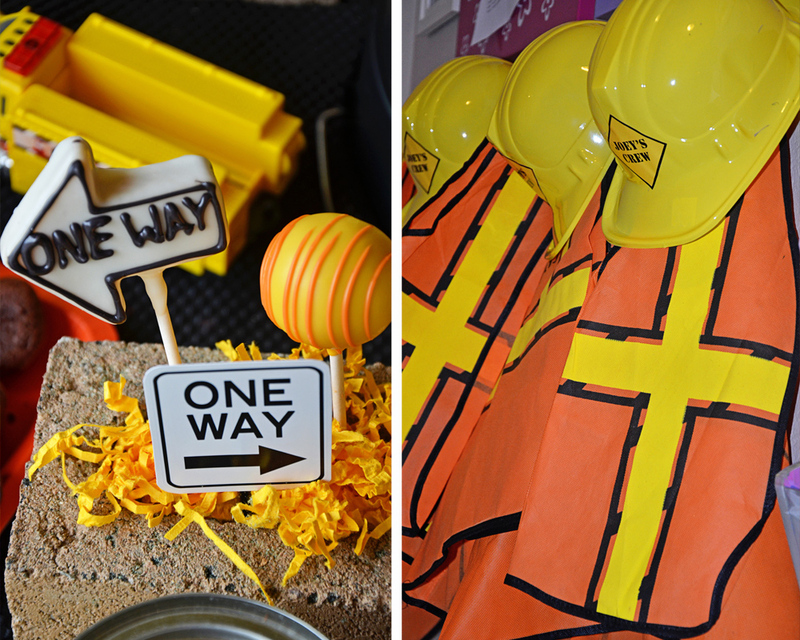 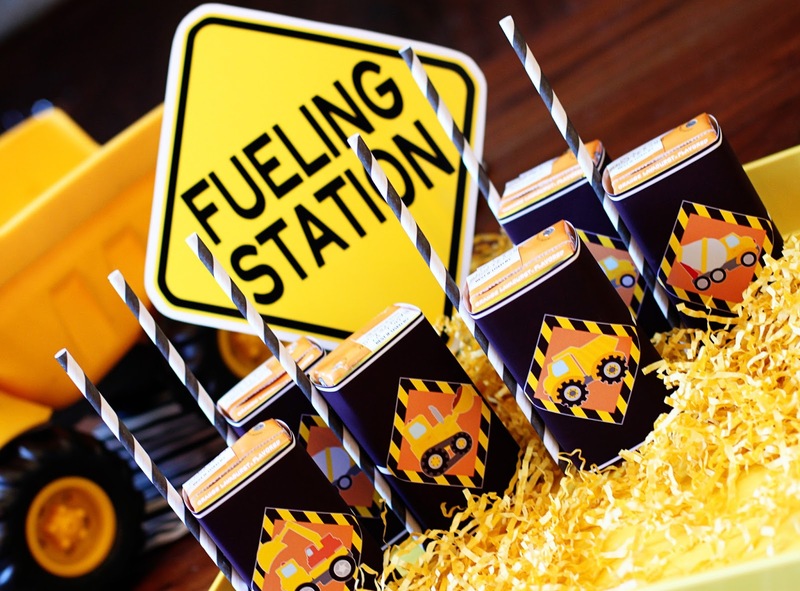 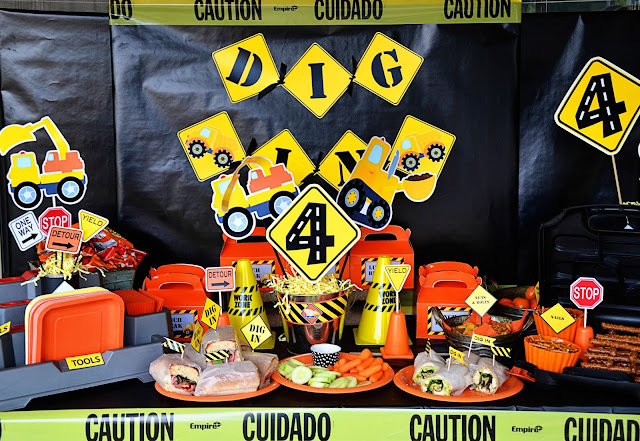 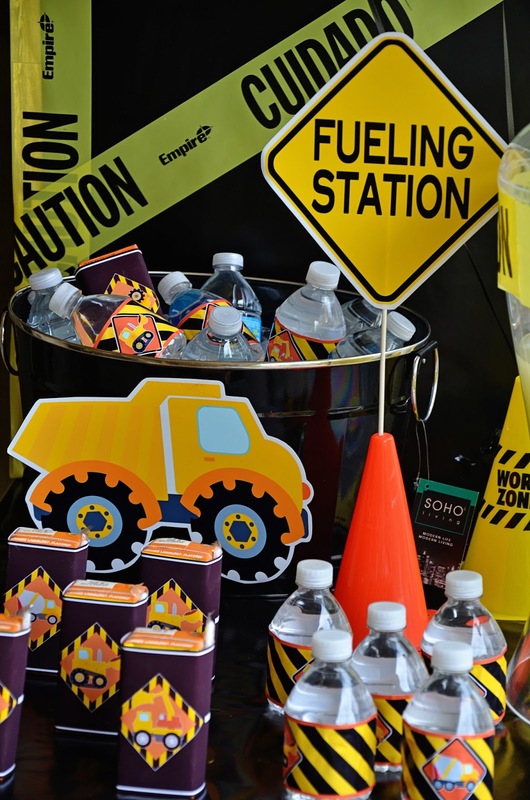 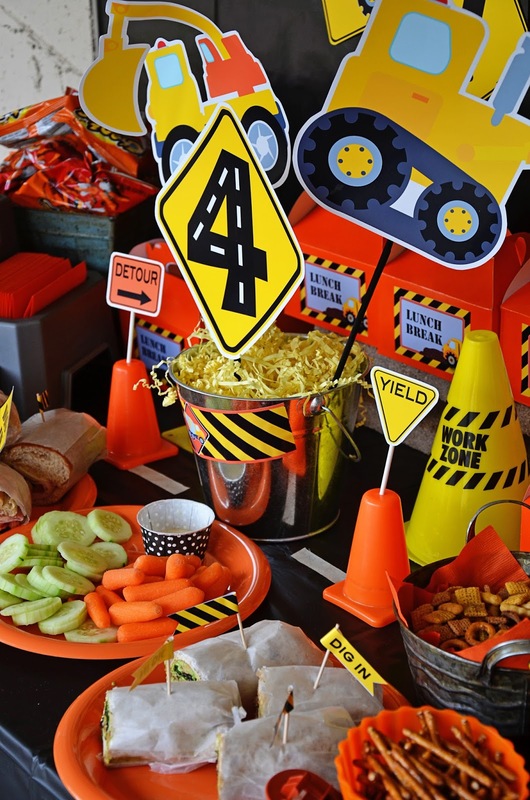 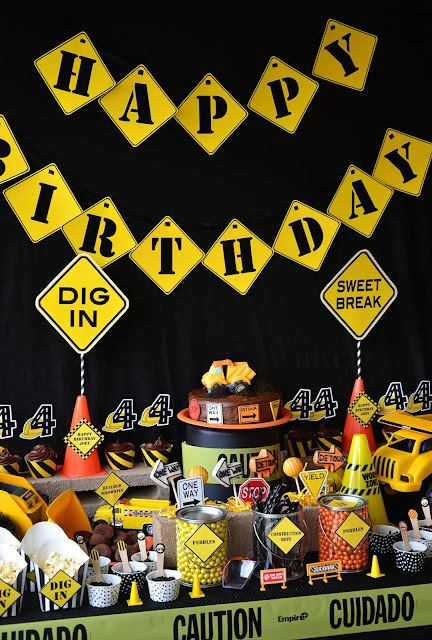 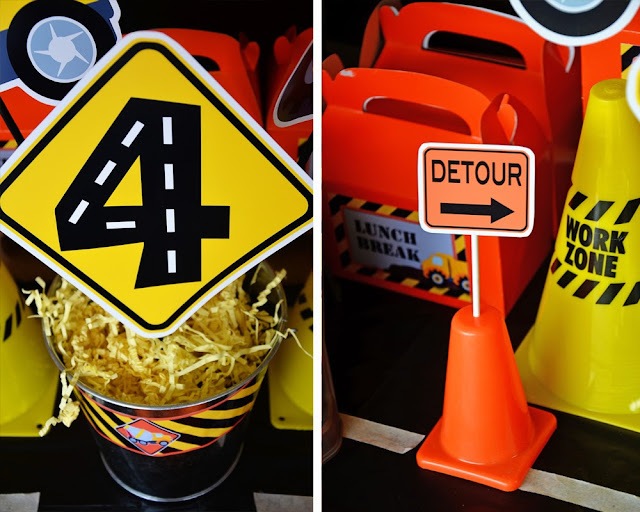 To recreate a construction site, I used CAUTION tape, tool boxes, traffic cones, inflatable Traffic Signs from Oriental Trading, dump trucks and Construction signs from the Amanda's Parties To Go Construction Party Printable set. At the entrance to the party, we used a step stool to greet guests with some yellow, orange and black helium balloons and road signs from the Construction Printable Set that read “Party Under Construction", "Detour", "Joey's Construction Crew", "Danger" and "Stop." Joey had a custom made tee from *Golden* that had number 4 on the front and his name on the back. 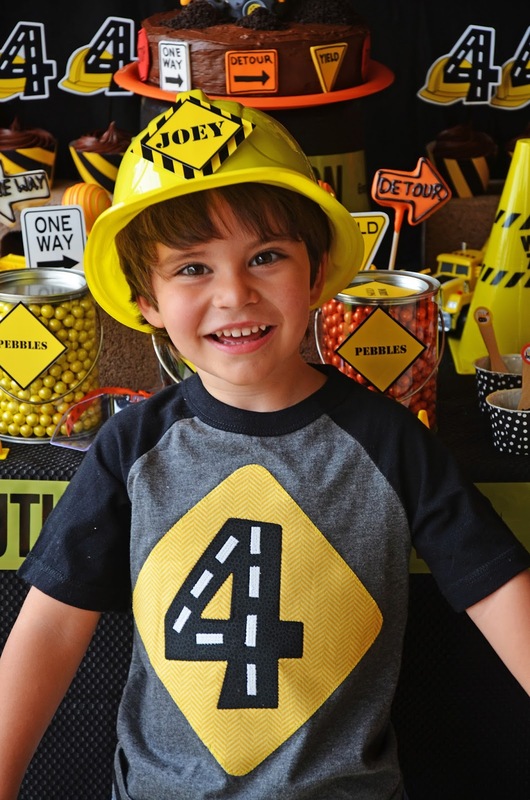 It is now his favorite shirt! Each child received a construction hat and vest upon arrival and they became part of Joey's Crew. 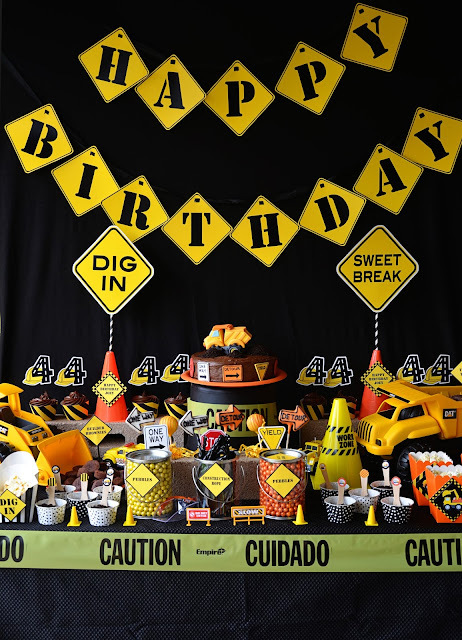 The dessert table was the focus of the party. 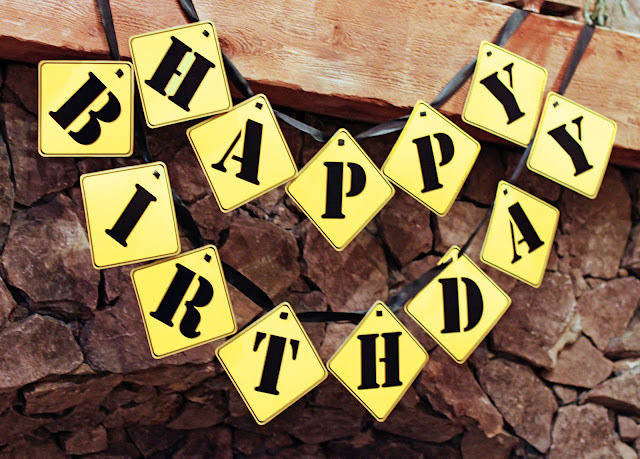 I used a piece of plywood covered with black fabric to display the "Happy Birthday" banner. 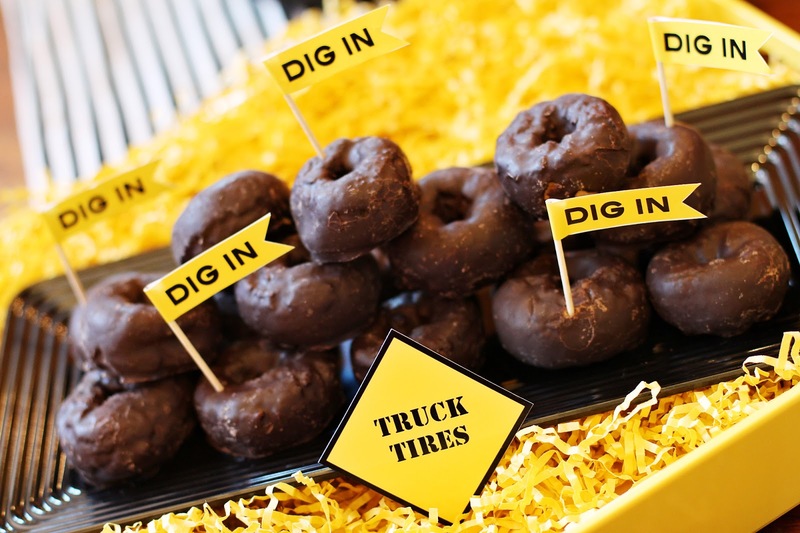 The delicious sweet treats were served inside dump trucks, on top of cement blocks and inside paint buckets. The children enjoyed some road signs cake pops from Astonishing Cakes, pebbles (chocolate shimmer yellow and orange candies), construction rope (black licorice), builder brownies, dirt cups (chocolate pudding), truck tires (donuts) and popcorn. 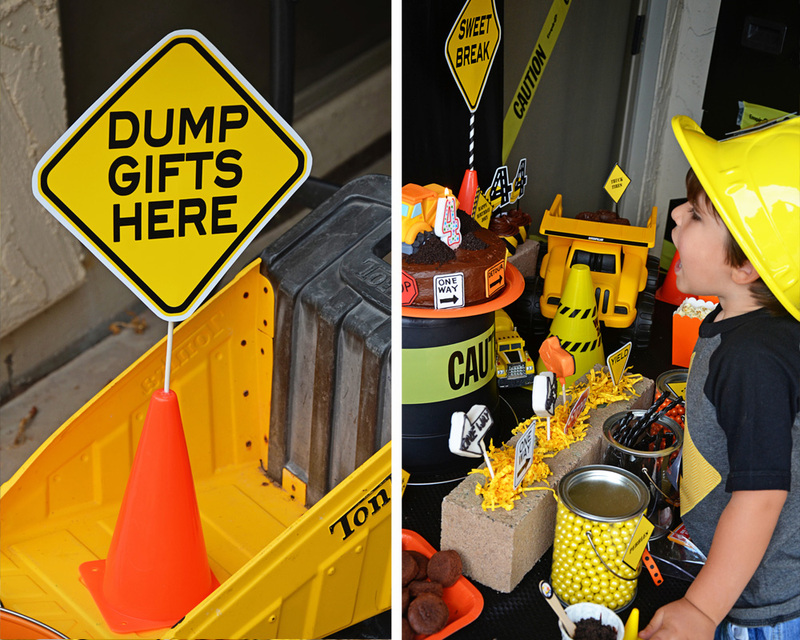 The cake was made to resemble a dump site. Edible Details made an edible 3D fondant dump truck that matched perfectly with the printable set. 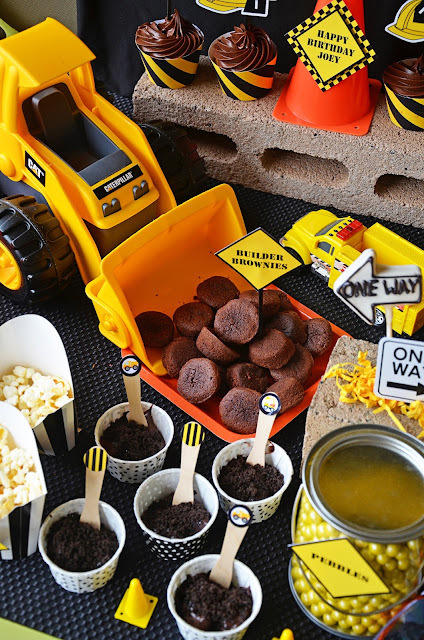 For the dirt I added some crush oreos to the top of the cake. The kids table and activity tables became a road by using a black tablecloth and masking tape for the road lines. I used scrapbook paper as place mats, orange plates and juice with cute labels from the Construction Printable Set around them. Each child received their own lunch box with a sandwich, carrots and cheese stick. 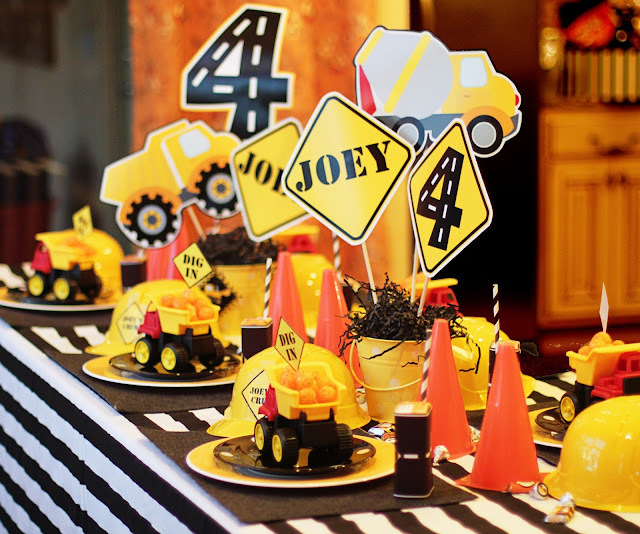 The table was also decorated with traffic cones and mini construction machines that I found at Walmart. Our "Dig In" Station was filled with yummy food for our guests to enjoy. 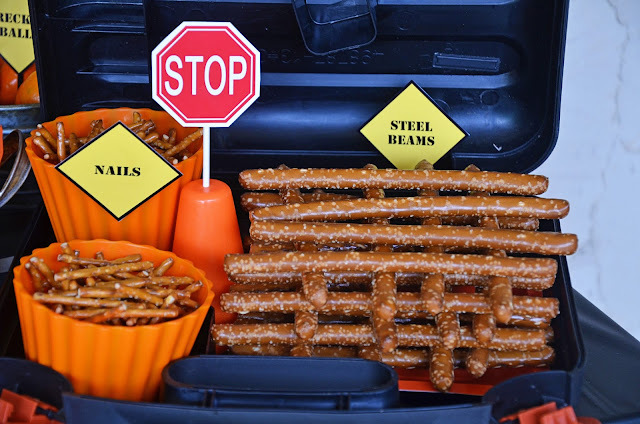 We served chicken wraps, subs, nails (pretzel sticks), wrecking balls (cuties), steel beams (rod pretzels). 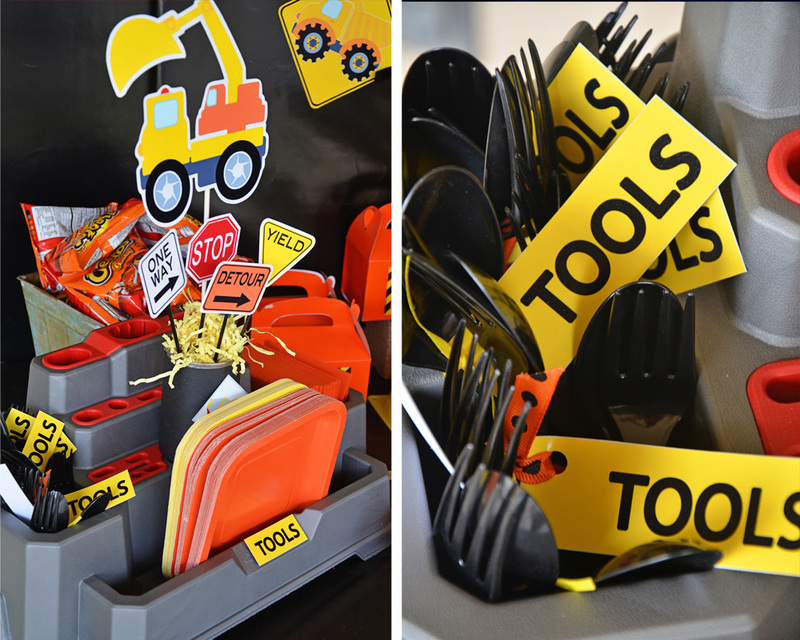 I used a tool organized that I found at Home Depot to hold the tools (utensils), plates and napkins. At our "Fueling Station," we served lemonade, juice boxes and water bottles. 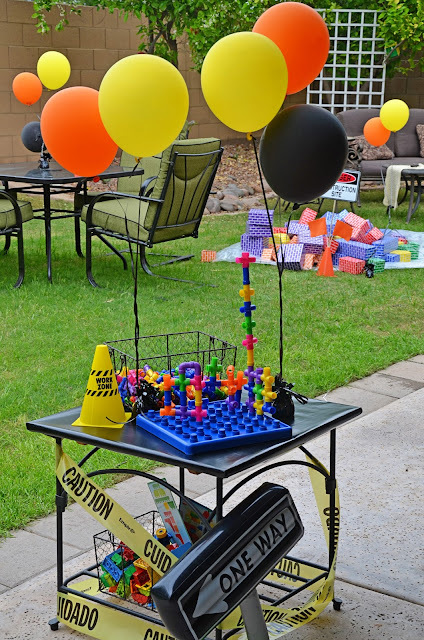 There were lots of fun activity stations set up for the kids. We had a construction site with building bricks, they designed their own construction site stickers scenes, cone toss, digging station, plastic piper connector station and nuts/bolts station. 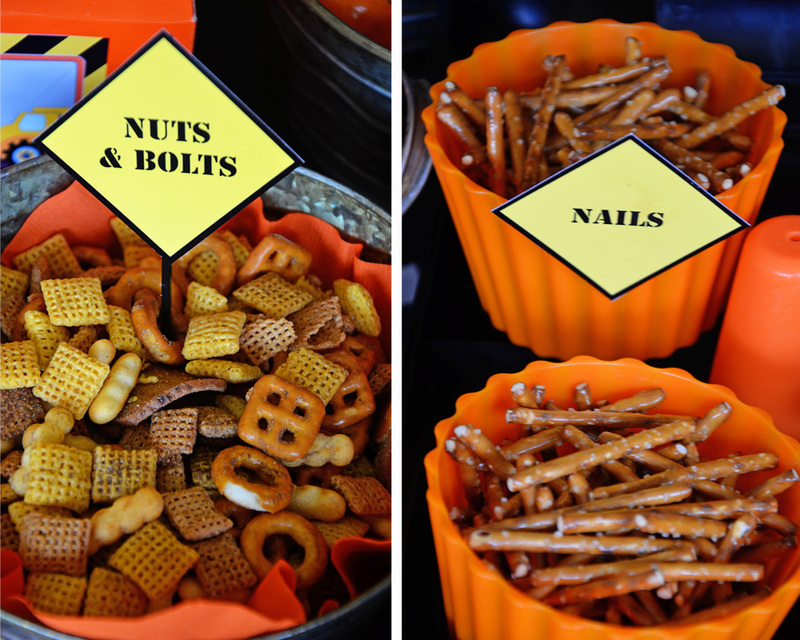 At the nuts/bolts station, kids had fun matching up the nuts and bolts to make a pair! I found the nuts/bolts set and the plastic piper connector on Oriental Trading site and my son still enjoys playing with them on daily bases. 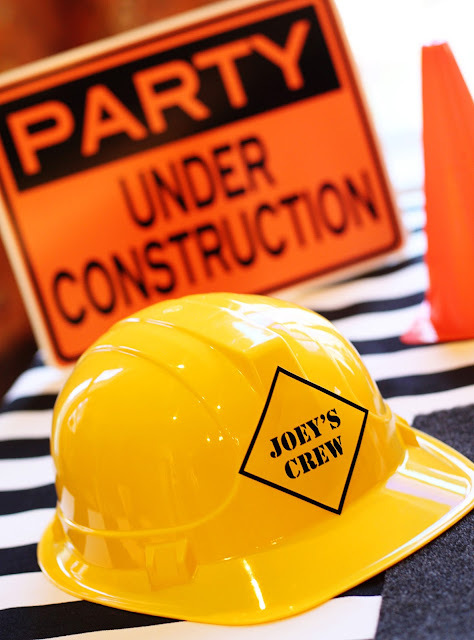 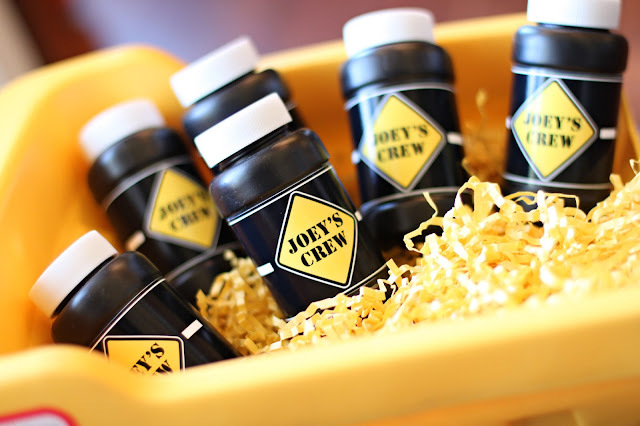 It was finally time to "pay" Joey's crew for a job well done! 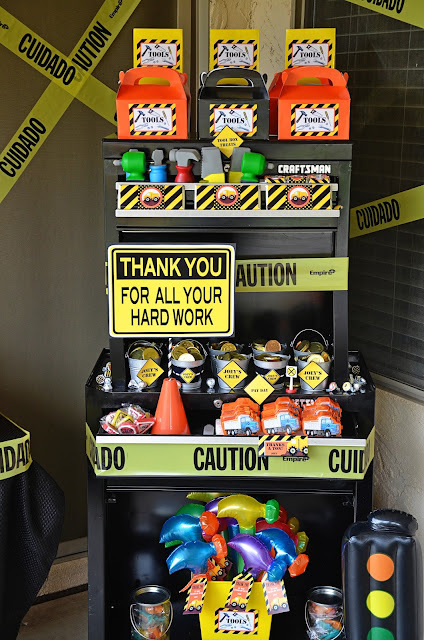 I used my husband's Craftsman tool center to display all the fun favors that the children took home. 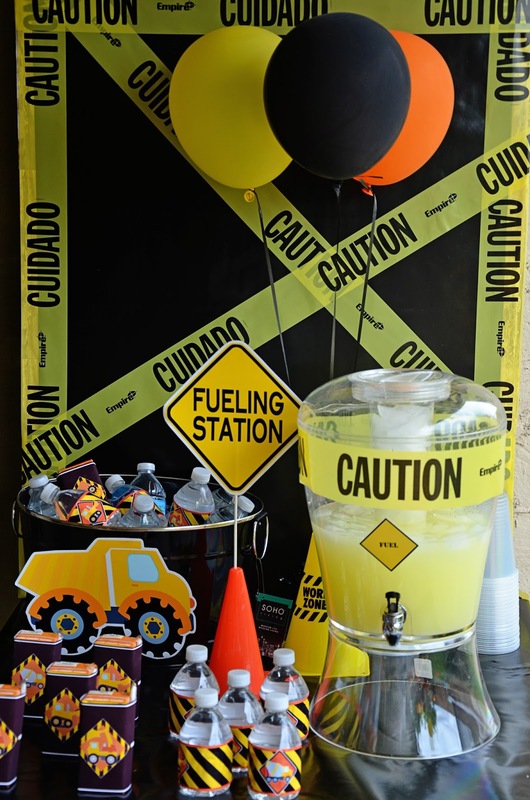 We called it the "Pay Day Station." Children received their own tool box, and they filled them with street signs lollipops, chocolate coins, gummy tool treat packs, tool squirts, dump truck stationary. 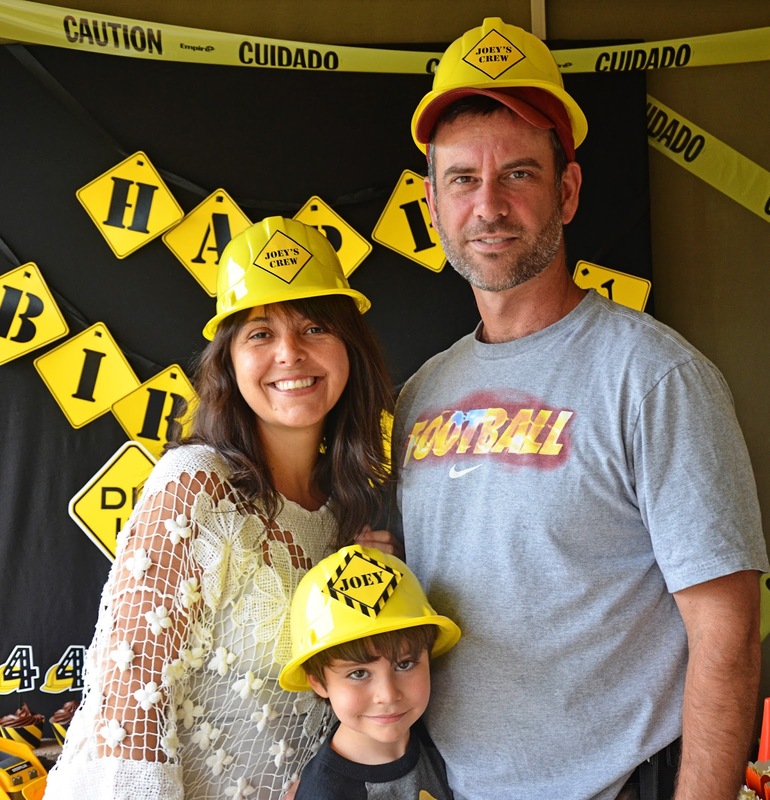 They also took home a inflatable hammer. 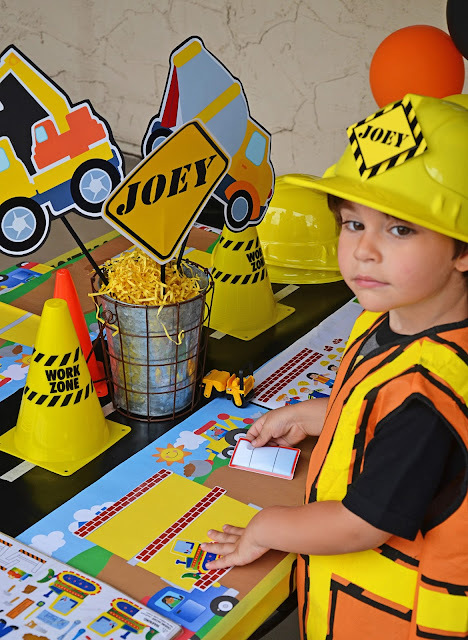 Joey and his crew had a blast and he is already talking about his next birthday party! 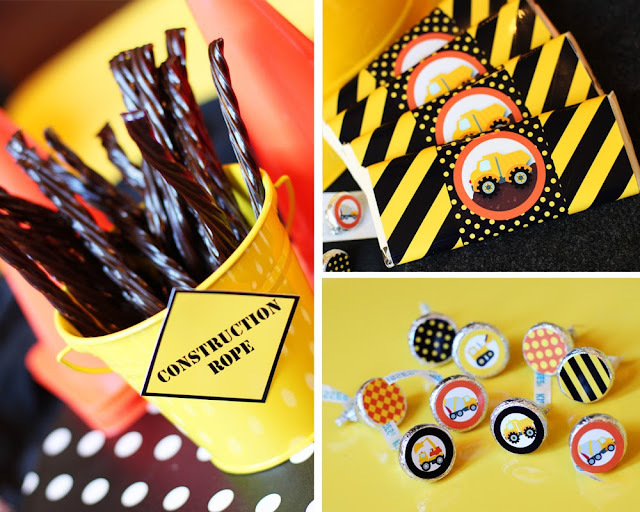 Can't get over the fantastic construction details and printables! 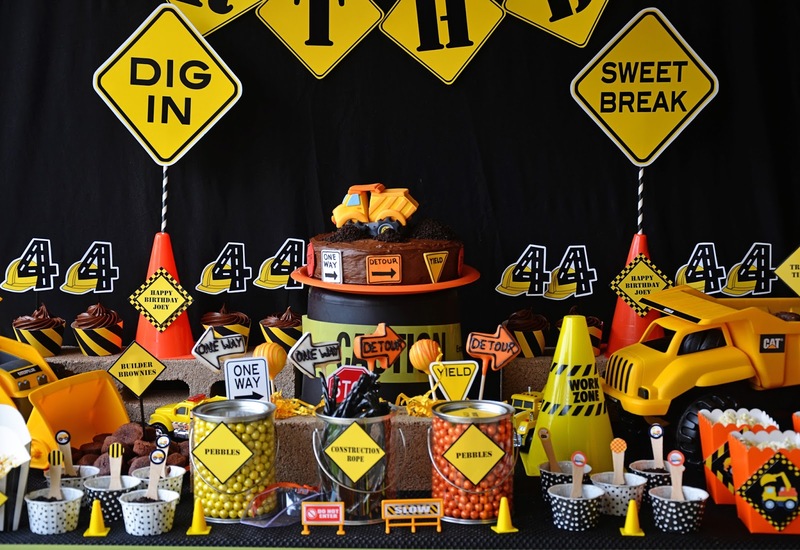 Everything is perfectly coordinated with the theme, and so bright, colorful, and appealing!